I love the smell of an old barbershop. The mixture of talc, hair tonics, Barbicide, and cheap coffee creates a distinctly manly smell that brings back a lot of memories for me – memories of Saturday mornings at the Friendly Barbershop in downtown Edmond, Oklahoma, sitting in a hard plastic chair reading 1960s Archie comics while I waited to get my ears lowered. 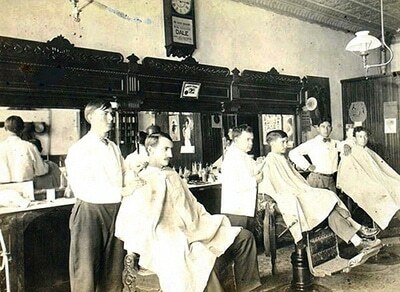 I also enjoy how the smell of the barbershop lingers on you even after you walk out the door. It’s silly, but the smell of a barbershop puts a little bit of pep in my step for the rest of the day. Chicks dig the barbershop smell, too. Well, at least my wife likes it. She always notes how manly I smell after I get my haircut. I think she’s a bit jealous; salons smell like chemicals and hairspray. 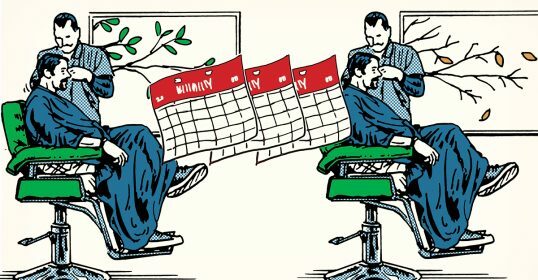 So a few weeks ago I got to thinking-Why limit myself to enjoying the barbershop smell to days I visited the barbershop? I decided to figure out just what components made up one of my favorite manly smells, so I could enjoy a hit of that great scent in-between haircuts. During my last trip to my friendly barber I took some notes on what sort of stuff a man could stock in his medicine cabinet in order to enjoy that barbershop smell every day of the year. Here is my report. The few times I’ve had a straight razor shave, the barber has used sandalwood shaving cream to lather up my whiskers. Sandalwood has been used for millennia by men in religious ceremonies and is the go-to scent for participants in the ritual of shaving. Sandalwood has a bright, masculine wood smell. 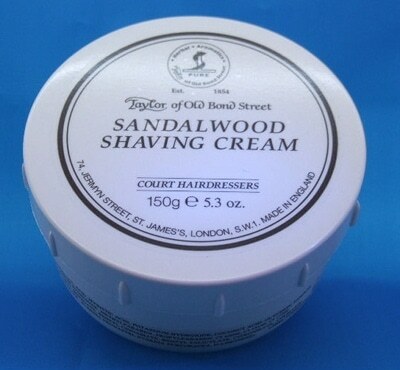 My favorite sandalwood shaving cream is from Taylor of Old Bond Street. After your shave, your barber will probably splash some sort of aftershave on your face. If he’s old-school, that aftershave will be Pinaud-Clubman. Since 1810, Pinaud-Clubman has been making the world smell manlier with their wide range of grooming products. 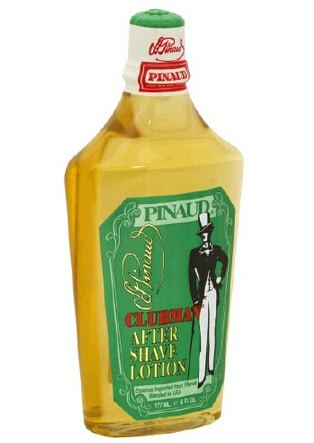 Pinaud-Clubman Aftershave Lotion is some potent stuff. You just need a small splash of it. You’ll find hints of orange, lemon, jasmine, and lavender with a warm musk background in this manly concoction. It also has a nice antiseptic alcohol smell to it. You’d think smelling like rubbing alcohol would be a bad thing, but somehow Pinaud-Clubman makes it work. Another a nice feature of Clubman aftershave is the price. A bottle will set you back just $3 at your local drugstore. One of my favorite parts of getting a haircut is when the barber uses a straight razor to shave my neck and the hairline behind my ears. After he’s done, he gives me a light dusting with some manly smelling talc. The talc helps soothe the skin after its close encounter with the straight edge razor. 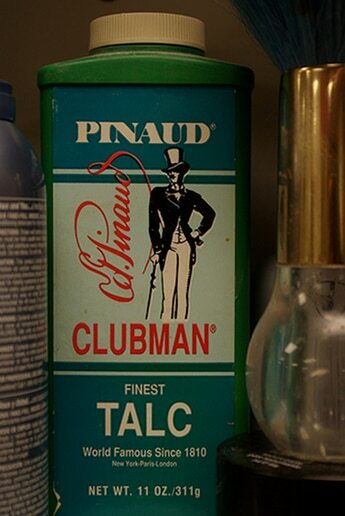 For decades, the talc of choice for neighborhood barbers has been Pinaud-Clubman. It has a very masculine smell. Somewhat similar to the Pinaud-Clubman aftershave, but much more subtle. You can use it after your shaves or as a body powder to keep yourself dry and smelling great in your nether regions on those hot and humid days. You can find Pinaud-Clubman Talc at your local drugstore. 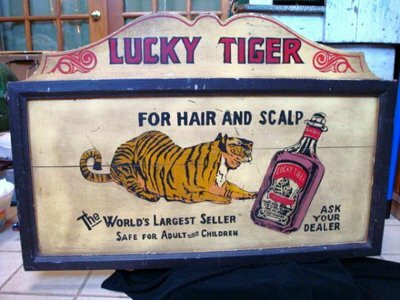 Since 1935, Lucky Tiger has been providing grooming supplies to barbers across the country. Walk into any old-school barbershop in America and you’ll probably find a neatly lined row of Lucky Tiger products sitting on a shelf somewhere near the barber. Lucky Tiger Three Purpose Hair Tonic conditions your hair and scalp so it looks and feels healthy. What I like about it is the nice tingly feeling you get in your scalp as your barber massages it into your head. “That means it’s working,” as an old barber told me in Vermont. And of course, Lucky Tiger smells absolutely manly. Beats that clear, lady-smelling goop you’ve been using in your hair. You can purchase Lucky Tiger at their online store or at most barber supply stores. 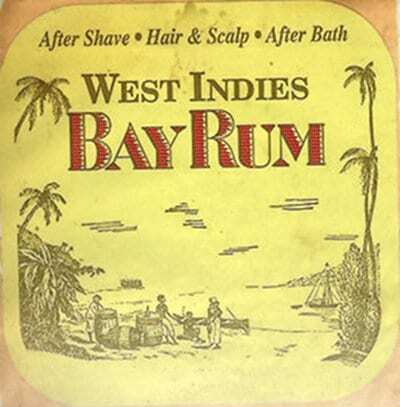 Bay rum has been around in some form or another since the 16th century. West Indies bay leaf, spices, and Jamaican rum combine to give the bay rum fragrance its distinctive woody, sweet, spicy, and oh so manly scent. Because of its island flavor, bay rum is a great summertime scent, but it’s a fine fragrance to sport year round. A barbershop worth its Barbicide will be well stocked with bay rum. You can get your own bottle of the stuff at a drugstore. And if you’re feeling particularly handy, you can make your own bay rum aftershave with these old fashioned recipes. What list of barbershop smells would be complete without mentioning Barbicide? 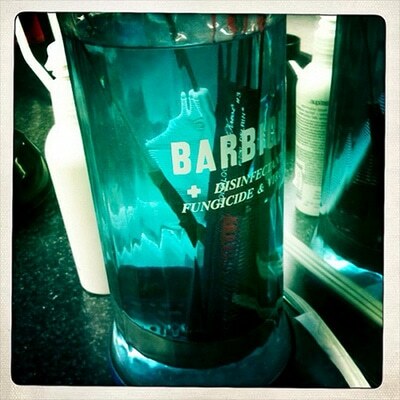 That translucent blue liquid in its trademark jar has been disinfecting the combs and scissors of barbers for over 50 years. Barbicide’s active ingredient is alkyl dimethyl benzyl ammonium chloride, so it has a clean, antiseptic smell. I don’t know why I enjoy the smell of it, but I do. I don’t expect a regular Joe to go out and buy a jar of Barbicide just so he can smell like a barbershop. But he would be my hero if he did. You can buy some on Amazon. I know I’m missing stuff. What other products do you suggest a man use in order to smell like a classic barbershop? Leave your suggestions in the comment box.